A fully customizable Shared Hosting service called “Custom Hosting” was launched by HostColor.com. It enables small business owners to design their own hosting accounts by choosing: disc space and bandwidth quotas, e-mail accounts, number of hosted sites on account, Dedicated IP; SSL certificate, CDN, FTP accounts, MySQL databases, Subdomains, SSH access and to use various site management services. Custom Hosting plan puts website owners in charge. It enables them to create their own website hosting service and to lower monthly bills. HostColor.com, a global web hosting provider that operates from data centers in United States and Europe has announced a new fully-cutomizable U.S. based Shared Hosting service named Custom Hosting. It enables website owners to create their own website hosting plan, so they can add to shopping cart only those items they need to use and to optimize their costs for web hosting. The “Custom Hosting” plan is suitable for small-business owners who manage more than one website. They can decide exactly how many websites to add to account by choosing from scale which grades from 1 to 20 hosted sites. The next step in the process of customizing web hosting service is to choose between IP-based and Name-based hosting account. IP-based means that all websites in the account are hosted on a dedicated IP address, while name-based signifies that all sites share the IP address of the host server system. A Dedicated IP is an important feature for websites that accept user registrations and process data. An IP-based website allows installation of a digital security certificate. (SSL). SSL certificate is a must to use feature for sites that accept online payments. Next two options in the “Custom Hosting” order page are disc storage and bandwidth quotas. The new account owner can start with 1 GB storage and to scale up to 100 gigabytes of RAID 10 protected storage. The options in the bandwidth scale vary between 1 - 100 gigabytes of quality Internet bandwidth. 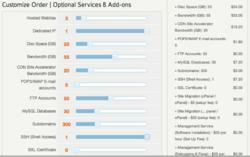 Another important advantage of the “Custom Hosting” plan is a service called “CDN Site Accelerator”. If the customer chooses a certain amount of CDN bandwidth, Host Color activates a global Content Delivery Network (CDN) for the account. The CDN makes possible for Internet users to open any website hosted in the Host Color's network from a web server located near their physical location. It also automatically optimizes web pages to minimize the number of network connections, which makes them to load very fast on any web browser. The technology used by the CDN provider compresses the data on the websites and stops illegitimate requests, so the servers concentrate on legitimate traffic. The users of “Custom Hosting” plan can also decide whether to use SSL certificate and SSH (Shell Access). They are also allowed to choose between a number of hosting management and site administration services such as “cPanel to cPanel migration”, “Software Installation”, “Debugging & Fixes” and “Fully Managed Shаred Account” (FMSA). FMSA service allows the account owner to outsource the administration and management to HostColor.com. Another option available in the “Custom Hosting” plan is an on-site Search Engine Optimization (SEO) service called FastSEO. As a part of this service, a SEO professional reviews the customer's web pages and prepares a report which will helps the site owner to optimize the website for higher ranking in Search engine results pages. Other customizable services part of the “Custom Hosting” plan are: POP3/IMAP E-mail accounts, FTP accounts, MySQL databases and Subdomains. “Custom Hosting” is the best small-business website solution offered by HostColor.com and one of the most advanced Shared Hosting service in the industry” says Martin Andreev, VP of Operations of HostColor.com. “It puts website owners in charge, allows them to design their own Shared accounts, to optimize resource usage and to decrease their costs for web hosting”, adds Mr. Andreev. Host Color has recently launched a promotional campaign on Unmetered Dedicated Hosting in its U.S. data center. Owners of high traffic websites are offered the opportunity to get Unmetered bandwidth on 100 Mbps Internet port for $399/month. To take advantage of the discounted price they have to use code 100MBPS. Host Color also adds a complimentary dedicated servers to the accounts of customers who sign up for the “Dedicated 100 Mbps Unmetered”. HostColor.com is a web hosting provider since 2000. It is owned by Host Color LLC, a Wilmington, Delaware, U.S. incorporated company. The company operates a fully-redundant network with 100% uptime SLA guarantee with uplinks to Level 3, Cogent and Internap. The company's core equipment is hosted in a high-class data center located 90 miles from Chicago in South Bend, Indiana. The strategic location and the redundant network operated by the hosting provider ensure the lowest possible latency to any point in North America and Europe. Host Color also provides website hosting services in Europe through its subsidiary Host Color Europe (hostcoloreurope.com).